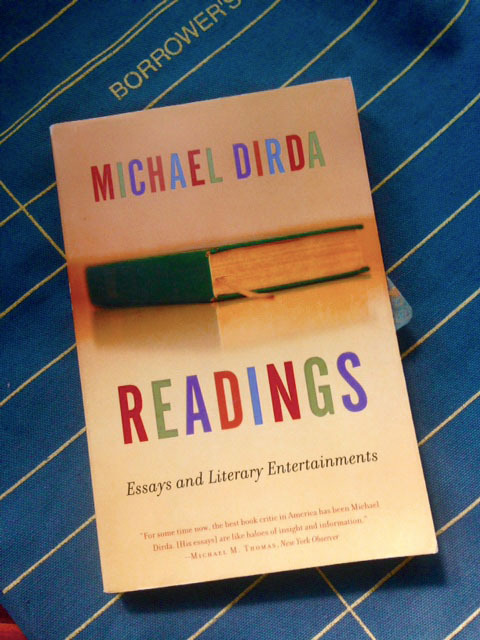 Having just finished up Michael Dirda’s book of essays about books, I feel quite bereft for several reasons, really. One is that no matter how hard I try, I will not reach his level of literary achievements – He seems to have a familiarity with every title out there, no matter how far back you go. Second – he writes extremely well about what he reads (without a trace of boasting about the sheer numbers), and three, he’s been awarded the Pulitzer Prize, and finally, four, he seems to be a nice all-around guy. Basically, this book is a collection of essays and columns from his writing at the Washington Post, and in the same vein as Nick Hornby (except a little more elevated, one might say). Hornby’s easier to read and pretty funny, whilst Dirda is much more scholarly and serious. Both are good in different ways – just depends what you’re in the mood for, really. Just be prepared to add oodles of titles to your TBR list. Sounds rather sensible to me. This entry was posted in Uncategorized and tagged books about books, Books in general, columns, essays, Non-fiction, Reading, TBR, writing by lizipaulk. Bookmark the permalink. This sounds great, I’d never heard of Dirda before but I’ll certainly look out for his writing now. If you’re a bookie person, you’ll like it, I think. I don’t think that they are too hard to find online.